Overclocking your Android phone can give you a little more juice to speed up your phone and possibly improve your battery life. 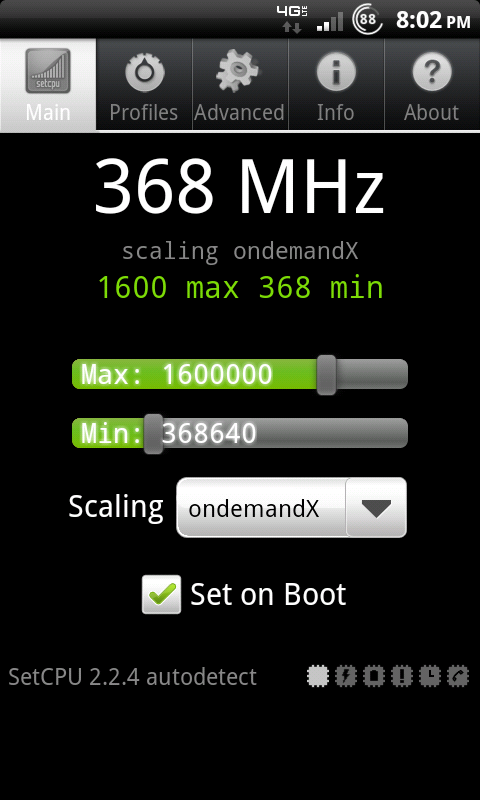 A custom Kernel installed on your phone (if your current Kernel does not allow overclocking). If you installed a custom ROM, then you may already be set since some ROMs come pre-installed with the Kernel of their choice. If you need to know how to download/install a Kernel, you can find my guide here. If you have everything above, then the next process is pretty simple. All you need to do is download an app called “Set CPU” from the Android Market. This app is currently $1.99. However, that’s not much for having total control over your phone’s CPU. You can then drag the maximum bar and the minimum bar to your desired needs. PLEASE NOTE: Your numbers above in the picture may not look exactly the same. The numbers will all depend on your phone and what Kernel you are using. ADDITIONAL NOTES: Do NOT set your maximum number to the max and do NOT set your minimum number to the min. Doing so will most likely cause your phone to lag or crash. If you set your phone’s CPU to the minimum then your phone will most likely have problems waking up. For instance, I’m currently using the HTC Thunderbolt and the minimum I could go to is 184Mhz while the maximum I could go to is 1900Mhz. With that range, I’m currently using 384Mhz for a minimum and 1600Mhz with the maximum. “Interactive” is a bit more aggressive at ramping up CPU speed based on load, and is slower to drop off to “idle” speeds once the demand has passed. “Ondemand” is a bit more conservative in the way it reacts; and will drop back to “idle” speed more quickly. “Interactive” makes the device significantly snappier, at the cost of battery life. “Ondemand” will last a bit longer batterywise, however; the device will seem a bit sluggish at times. When you’re all done, don’t forget to click the box “Enable on boot”. This way you won’t have to set your CPU settings every time you reboot your phone. However, if this is your first time playing with the settings, you may want to hold off on clicking this box. The reason why is if your phone freezes you can simply pull the battery and not have to worry about the settings being automatically applied on reboot. If you click “Profiles” on the top you can enable different CPU settings for when your phone is charging, the screen is off, etc. This can help save your battery life because when you define the settings for Screen Off, your phone won’t be using the the CPU settings you previously defined on the Main page. The settings you define on the Main page are just when you’re phone is in action. 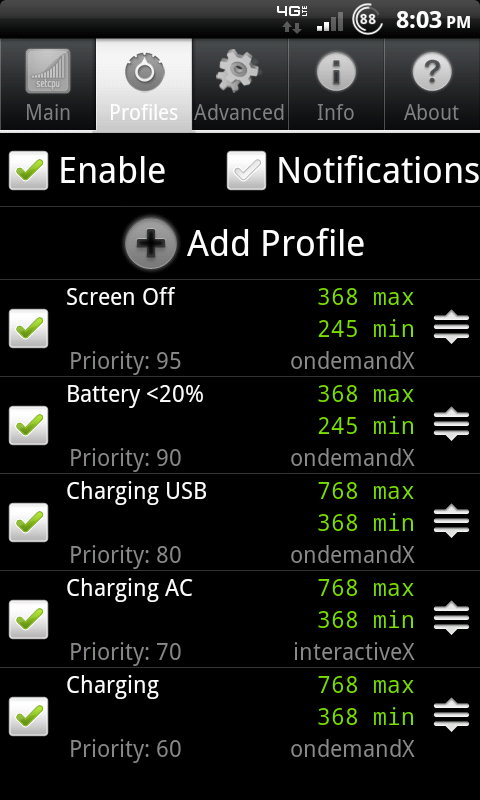 So for instance, under my Screen Off profile I set my phone’s CPU to a maximum of 368Mhz and a Minimum of 245Mhz. This is just enough that my phone won’t lag, freeze, or turn off. There’s no reason that my phone needs to be set to a maximum of 1600Mhz when the screen is off. If you set a profile for when your phone is charging, I would lower your maximum settings. The reason why? Charging produces heat. You don’t want to be overclocking your phone while your battery is charging. You could risk overheating. If you define your profiles, don’t forget to check the box next to it and don’t forget to check the “Enable” box on the top. Happy overclocking! Let me know if you have any questions or if you’re wondering about what settings to choose for your phone. Thanks for that. I followed your instructions. It’s impressive that you’ve been doing this such a short time, and have such an intricate understanding. I’m curious to see if my phone is a) faster; b) runs down the battery less. I find the battery issue on the Thunderbolt is fairly severe. I haven’t yet paid close attention to whether the Skyraider has improved battery. I really liked the DroidX more than the TBolt except for the 4G, obviously. And I’m really motivated to get rid of this phone when the better 4G phone comes along. What I’d really love is a phone similar to this but with a keyboard. I miss the Blackberry keyboard, much as I like everything else about the phone. I have nothing in the profiles and cannot go above 1024 i am rooted but not flashed is that the problem? Your kernel probably doesn’t support overclocking. You need to flash a supported kernel for your ROM and handset device, and then you should be able to overclock.